Abraham Lincoln established Thanksgiving as a national holiday by proclamation in 1863 when he urged Americans to set aside the last Thursday of November as a day of thanksgiving. (President Franklin D. Roosevelt later made it the fourth Thursday of November). However, days of thanksgiving or autumn “thanksgiving” feasts weren’t uncommon in American prior to Lincoln’s announcement. 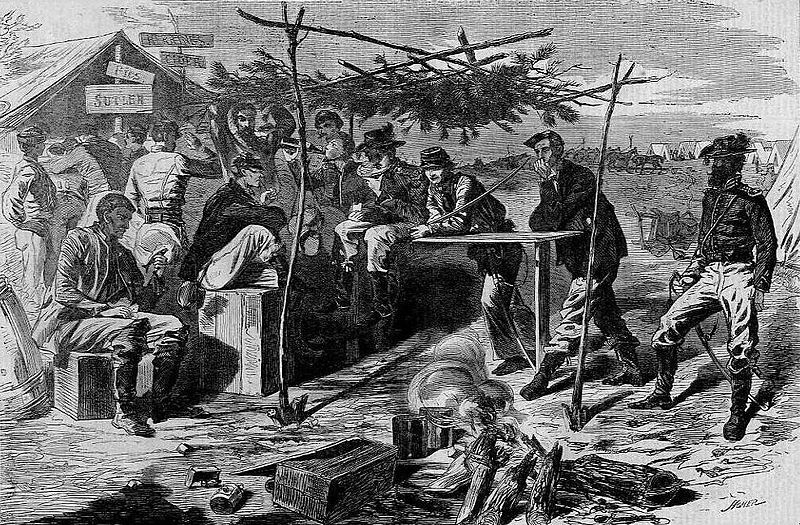 Thus, Civil War soldiers (particularly from the North) were familiar with the concept of harvest feasts and family gatherings, often choosing to have celebrations in camp or hospital as their supplies and time allowed. Private William P. Lamson, Jr.
You say it is cloudy and likely to rain. It’s been raining here for 2 or 3 days and is still cloudy, and the wind sounds as it does winter nights around our chimneys. It makes it seem some like home. If you have a Christmas tree I wish you a Merry time and a good share of the fruit. Edd’s Observer has not got along yet. Papers don’t general come as quick as letters, somehow. If they didn’t have Oysters at the sociable, I had some for dinner yesterday. I asked the Dr’s clerk if I couldn’t have tea for supper instead of coffee and when it came dinner time up came a dipper of oyster soup and a slice of bread for me and a dipper of tea and a slice of toasted bread and butter for supper and breakfast. There is not much to write about…. Clearly, thanksgiving celebrations didn’t start when Lincoln told the nation to begin. A thanksgiving family gathering and feast seems to have been a tradition in the Lamson Family, and other Northern families and communities celebrated too. In fact, thanksgiving celebrations were traditional in England, during the colonial era, and into the 19th Century; they provided a way for families or a community to gather to enjoy the harvest and socializing after the hard work of the season. By 1864, as Thanksgiving Day became an annually celebrated holiday, Union civilians started sending feasts to their soldiers and sailors. (You can find Meg Groeling’s article about this on Emerging Civil War.) Thanks to Sarah Hale (editor of a lady’s magazine) and Abraham Lincoln, the holiday celebration as we know it was officialized during the American Civil War years. Sure, this primary source isn’t the most colorful excerpt about Civil War Thanksgiving, but Will Lamson, Jr.’s letters are special to me. 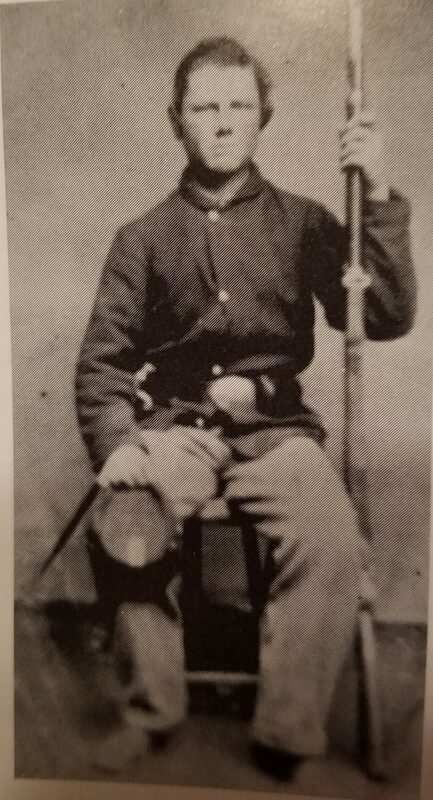 I’ll try to explain… When I was fourteen, I was fascinated with Joshua L. Chamberlain and the 20th Maine Regiment. (Some would say I had a historical crush – weird, right?) Well, about that time, I made my first trip to the east coast and started touring battlefields. At Wilderness Battlefield (Virginia), I found a small published book of transcribed letters by William P. Lamson, and I bought the book, so excited to read a common soldier’s perspective on the “famous” Colonel Chamberlain. Was I ever disappointed? Chamberlain’s name is absent from the letters. 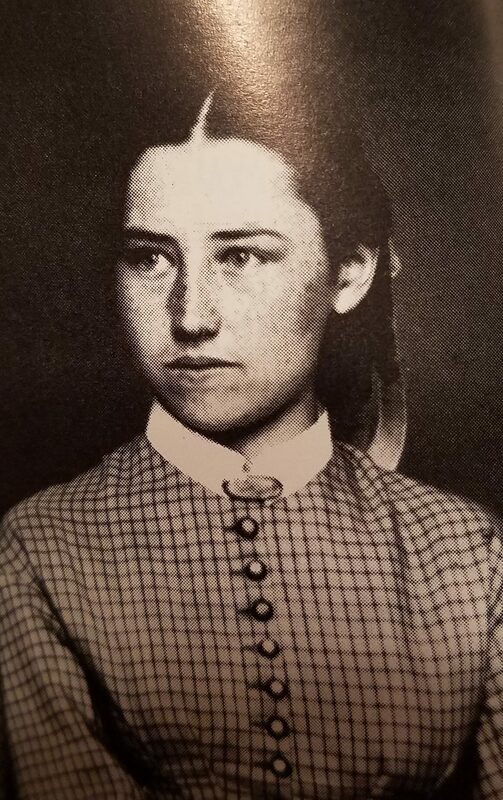 Jennie Lamson – Wills sister and recipient of most of his preserved letters. Instead, this small collection is filled with details about Lamson’s “everyday life” as a common soldier and lots of questions and gossip about friends at home. Most of the letters were written to his younger sister and a couple to other family members. I eventually got over my historical obsession with Chamberlain and gained a better appreciation for the simple letters and observations. I’m thankful for Will Lamson’s letter because it sums up the perspectives of a common soldier on a Thanksgiving during the Civil War. As Lamson wrote from a hospital bed in Alexandria, Virginia, he was remembering the happy memories of home, sharing what news he had, and communicating with his sister. Lamson would recover from that illness; however, he was killed at Battle of the Wilderness (May 1864). Across the decades, his written words come as a whispered benediction to all who have loved ones far from home this year or forever absent: You wish I could be home at Thanksgiving Day. You think you will miss me? P.S. Do you have a favorite account or quote about Thanksgiving from the Civil War era? Share it in a comment! Previous Blockade Runners: Running The Confederate Economy?